Apple's iPad Mini WiFi can be bought online on various websites @ $ 329 onwards / Pounds 269 onwards plus VAT / Rupees 21900/- onwards. Apple's smartphones and tablets has a dedicated fan base since its launch & no wonder it still rules millions of hearts, and this tablet undoubtedly looks very elegant, classy & packs in great performance specifications. Apple iPad Mini WiFi sports a 7.9 Inch LED Backlit IPS LCD Capacitive Touch Screen with multi touch. The front panel of Apple iPad Mini Wifi features a XGA display with a resolution of 768 x 1024 Pixels, ~162 ppi pixels density, 16 M Colours. This tablet also boasts of Oleophobic coating which will keep the front panel oil free and fingerprint free. Dimensionally Apple iPad Mini is very slick as it measures 200 x 134.7 x 7.2 mm (7.87 x 5.30 x 0.28 in), it weighs 308 gms (10.86 oz) & as usual there are two colour options to select from viz; Black / Slate, White / Silver. Just under the hood of this elegant looking Apple iPad Mini is packed a Dual Core 1 GHz Cortex A9 Processor, Apple A5 Chipset, PowerVR SGX542MP2 GPU, 512 MB RAM. The technical aspect of this tablet is loaded adequately to run multi tasks and play latest games. Apple iPad Mini WiFi comes out of the box with iOS v6, which is further upgradable to iOS v6.1.3 & there is a planned upgrade to iOS v7.0. This tablet is available in three variants in terms of internal memory viz; 16 GB / 32 GB / 64 GB storage & like all other Apple smartphone and tablets it also lacks support for microSD card. 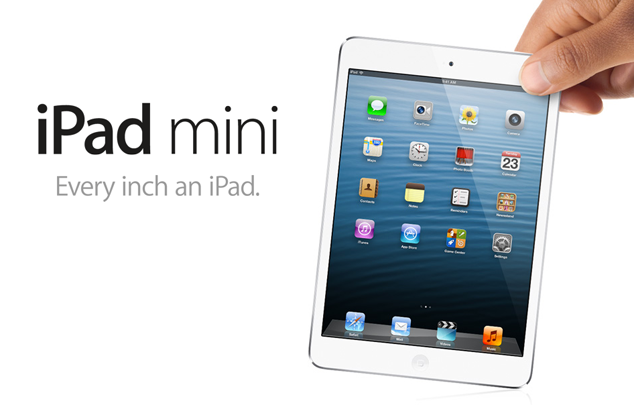 The data connectivity aspect of Apple iPad Mini features Wifi, Bluetooth v4.0 A2DP & EDR, microUSB v2.0. This tablet holds a 5 MP primary camera on the rear panel with auto focus, geo tagging, touch focus, face detection, video stabilization. This primary camera in Apple iPad Mini is capable of clicking images of 2592 x 1944 pixels resolution & record HD videos of 1080 P @ 30 fps. On the front panel of this tablet is a 1.2 MP secondary camera with face detection, face time over Wifi. This secondary camera is capable of recording videos of 720 P @ 30 fps & will give an awesome video chatting experience. Apple iPad Mini WiFi holds a Non-Removable Li-Po Battery with a juice of 16.3 Wh (likely ~4400 mAh). This tablet can be bought online on www.flipkart.com, www.store.apple.com/uk, www.store.apple.com/us.